Ivanhoe Reservoir (Los Angeles, California) has a problem. Bright sunlight, chlorine and natural bromides combined together to form the carcinogen bromate and now Ivanhoe Reservoir is contaminated. The only way to effectively remove the chemical is to drain the entire body of water and clean the bottom surface to remove all the bromate. 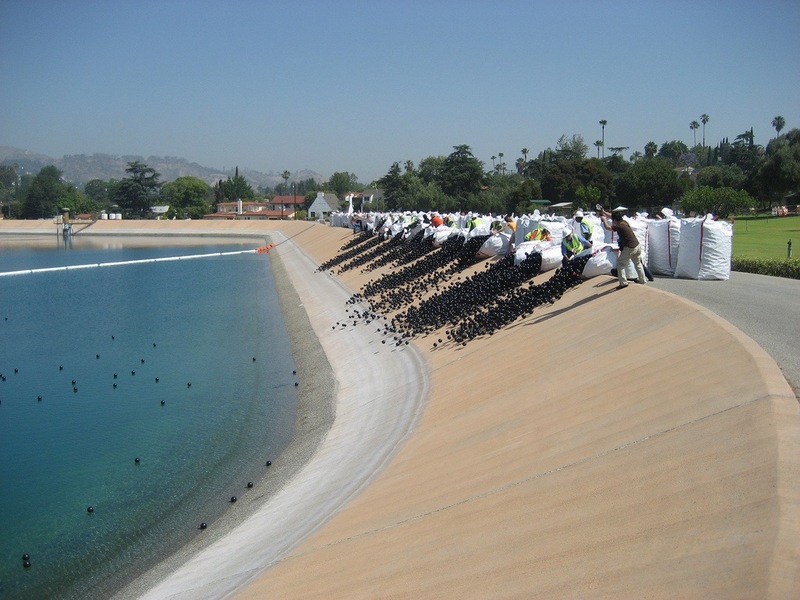 In the meantime, the Department of Water Protection has mandated that all reservoirs be covered and have planned for the entire reservoir to be relocated underground near Forest Lawn Cemetery. That will solve the issue of sunlight aiding the generation of bromate, but what happens in the four to six years while the new reservoir is being built? There will always be natural bromides present in groundwater, chlorine is added and sunlight, well this is southern California, sunshine is a given. How can a reservoir be shaded? The solution is amazing, ingenious and alarming. 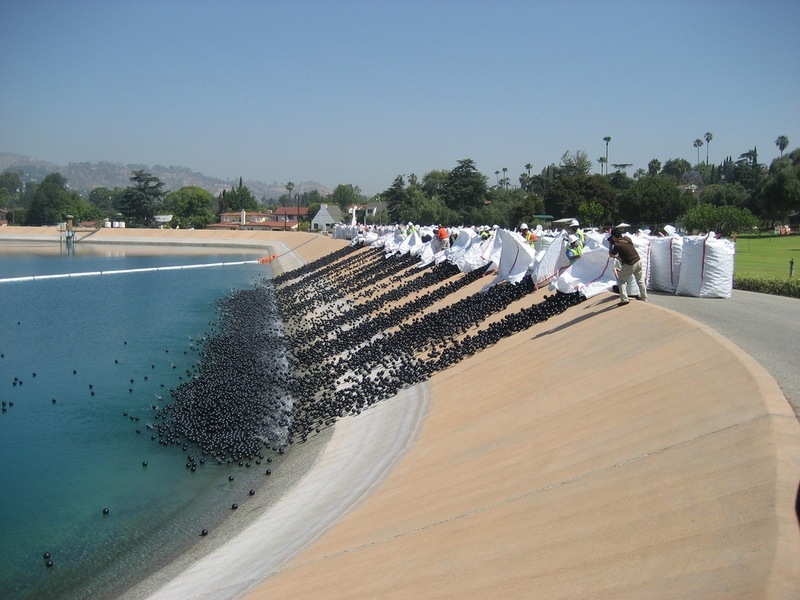 The Department of Water Protection calls for 3 million black 'bird balls' to be dumped in to the reservoir to shade the water! The black balls are non-toxic and UVA-stable meaning that they will not degrade in sunlight or release additional chemicals into the water supply. At a cost of around $2 million each ball works out to 34 cents each and is shipped all the way from Allentown, Pennsylvania. 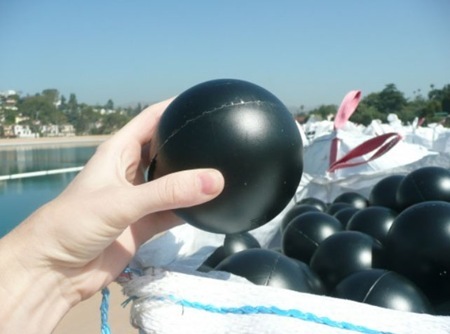 The order is so large in fact that the manufacturer, Orange Products, has dedicated itself to solely producing the required balls for Ivanhoe Reservoir. No sunlight. No bromate. No problem, right? The only ones not pleased appear to be nearby neighbors and of course any waterfowl looking for a nice place to rest. I will completely avoid the issue of water resource depletion and diversion of the natural water cycle. Those issues are too large and complex to be presented in this post. 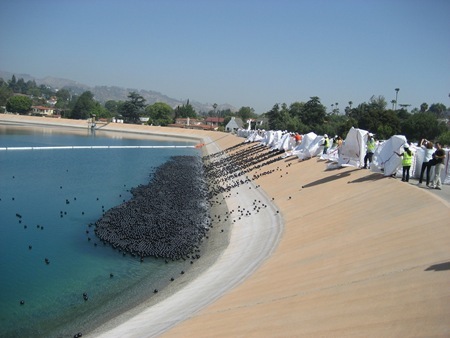 What I would like to point out is that the problems at the Ivanhoe Reservoir are artificial. The original builders created a lake where none existed before, a concrete basin built from the sludge hydraulically pumped from the bottom of the canyon (by coincidence, this technology was studied and adapted for use in the building of the Panama Canal). Nature had not put enough potable water in the city so we made our own. Then when this artificial lake failed to keep our water clean we introduced a chemical, chlorine, to help do the job natural ecosystems have perfected over millions of years. Unforeseen elements conspired against us an bromate was created. 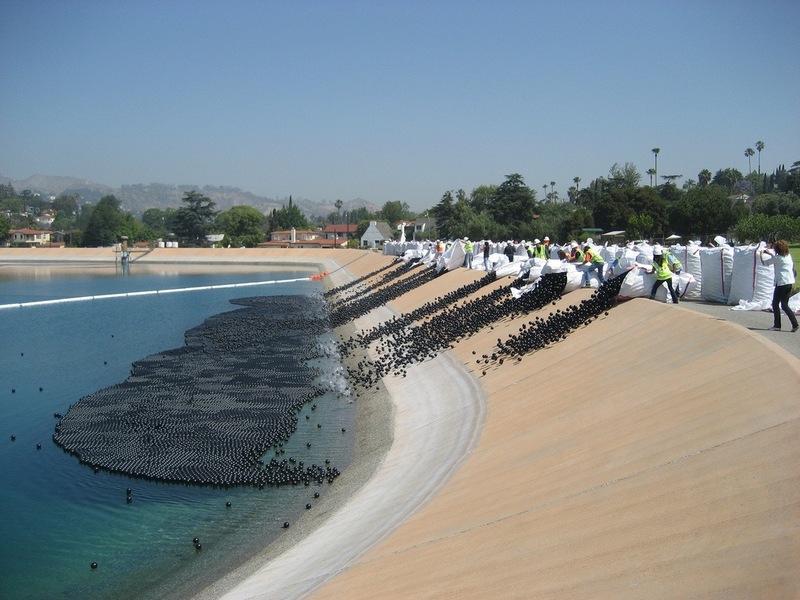 Now, we are designing our way out of another problem by placing 3 million black plastic balls on a lake. It has to be said, the Ivanhoe Reservoir is no doubt a success overall. 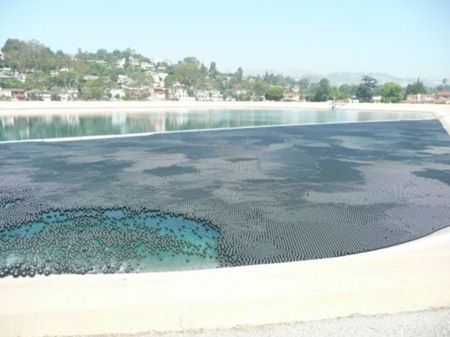 It has given Los Angelinos safe water for a hundred years. The few problems with the reservoir have been dealt with effectively. 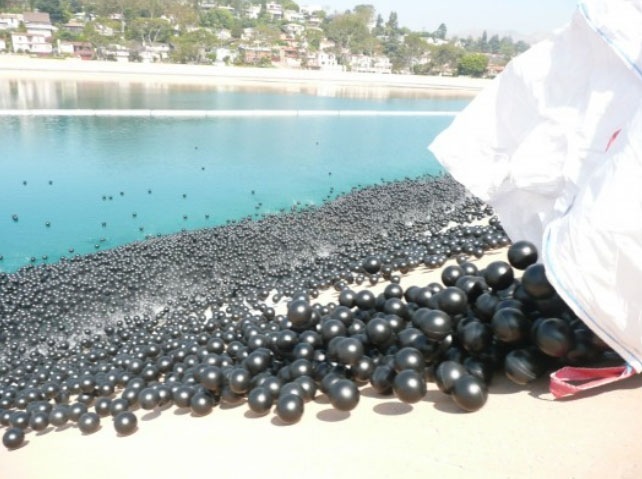 But isn't there a message hidden somewhere in these fantastic photos of bird balls being dumped onto a lake. There must be a point where technology and ingenuity get evaluated not only on the basis of effectiveness at the present, but sustainability in the future. Shouldn't our architectural manifestations exist benignly in both the present and the future? The photos illustrate to me an arrogance, a disregard and lack of understanding for the subtleties of our environment. I for one hope that designers and problem solvers around the world start to see the world a little differently, connected, and find solutions that respect the environment, economy and society equally. Past. Present. And Future. For more information read the original article in the LATimes or at LACurbed. August 4th, 2008 at 1:10 AM. Posted in . Share this post. Wow. My blog comes up in the top 10 about these bird balls...yet you don't even mention it, or talk about the most serious problem: these hdpe balls have not been tested for safety! The lazy LA DWP didn't try other ways of purifying the water. You know what they did? Dunked some beakers in at various depths, and then gave up. And the NSF tested these balls under only one condition, for 17 days: at 73 degrees F. That's it! 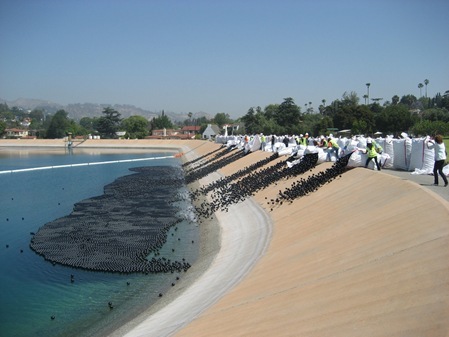 Expect to see leaching into the water very soon, and since the DWP doesn't test for plastic leaching...who will know?! Not to mention that this plastic was not recycled, nor will it be. Not to mention that Silver Lake is a migratory flyway, so more than a few waterfowl will be unhappy. LA Observed got their info from me, and linked to me. So did the LA Times. These bird balls didn't solve a problem, they created one.